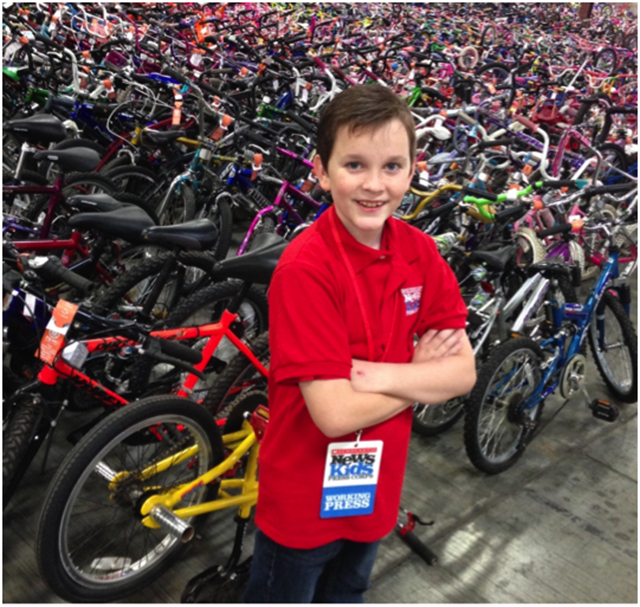 Holiday Giving Shifts into High Gear | Kid Reporters' Notebook | Scholastic Inc. Dusty bikes are getting a new lease on life thanks to a Twin Cities organization. Free Bikes for Kids (fb4K.com) has been collecting gently used bikes since October and preparing them for kids who may not have one. The program seven years ago when cycling enthusiast Terry Esau collected 50 bikes to give away during the holiday season. He had so much fun doing it that he turned his efforts into a nonprofit organization. This year, more than 6,000 bikes of all types and sizes are being prepared for children throughout Minnesota. Each day, as many as 150 volunteers are sorting, cleaning, and repairing the bikes to get them ready for their new owners. The bikes will start rolling out the door on “Give-A-Way Day,” which is planned for December 6. More than150 community organizations, churches, schools, and nonprofit organizations will come to the Minneapolis warehouse to pick up bikes for the kids they serve. Virtually all the donated bikes will have new homes after December 6. If there are any bikes left over, Free Bikes for Kids will ship them to kids in need overseas or give them to local bike shops. The Free Bikes for Kids program is just in Minnesota right now, but they hope to replicate the program in other states. This is an organization that is certainly on a roll!